Age of Conan Producer and Game Director Gaute Godager has resigned from Funcom, stating his dissatisfaction with the game as the key reason for his departure. Anarchy Online Producer and Game Director Craig Morrison will be taking over the vacated position. 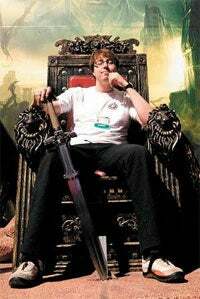 Gaute was with the company for 16 years, and will be sorely missed by the Funcom and fans of their games alike. "I have done my very best making this fabulous game, but I have concluded there are elements which I am dissatisfied with. I have decided to act on this, and as a result I have chosen to leave Funcom. It is time to get new, fresh eyes on Age of Conan, and I wholeheartedly support the appointment of Craig. I have had a fantastic time these last 16 years, and I am very proud of the many things Funcom has achieved. Funcom and Conan will always be a big part of me, but as I now look to new ventures outside the gaming industry I am certain Age of Conan's future is in the best of hands."